Did you know that the song that plays when Tarr are near is called Those Awful Ravenous Rainbows? Put the first letters of those words together, and do you know what you get? If you have any interesting facts about Slime Rancher, do tell below! The Phase Lemon physically resembles a lemon, in particular the common supermarket Eureka variety which can be produced all year round. Its name may be a reference to author and Professor Emeritus Don S. Lemons, who studies primarily in plasma physics. Now, plasma is one of the four fundamental states of matter, also called "phases"; the other three being solid, liquid, and gas. The method of turning a ripe lemon solid by shooting its tree with fruit may be a loose reference to phase transition, since you turn an ethereal lemon solid. Up until the addition of heart beets, the rock slime's placeholder favourite food was the prickle pear - one of the many aspects of the game that hint to its heavy planning. 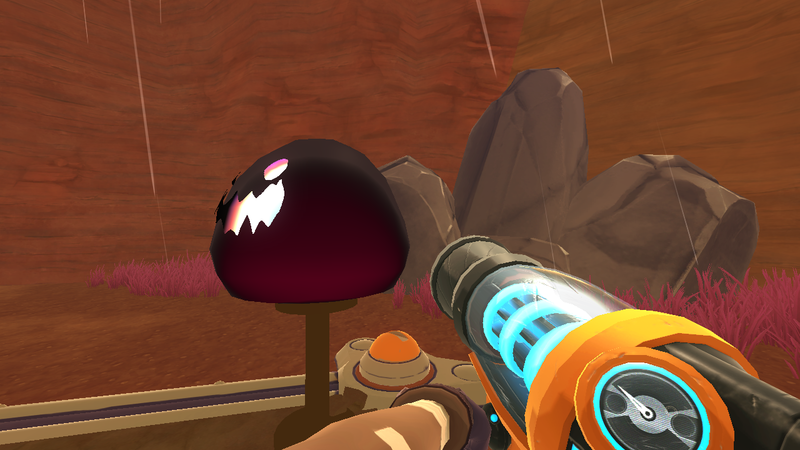 Scareslimes have used the old prototype tarr texture before they were updated. Compare this to this. The prototype Ruins used to have a Boom Gordo and a bunch of slime nodes in it, but they were disalbed in the public releases. Same thing goes for the prototype beach. Oh, and did you know it had an Oca Oca patch? If they did, you could catch a saber gordo in a trap, and popping it would give you pure saber slimes. did saber gordos even exist? cuberries appear far more frequently in the dry reef than any other biome, and they occur in the slime sea more than any other food item. Mosaic Slimes' sparkly effect, and its its ability to mesmerise other slimes (both pure and Largo) can be turned off indefinitely by placing it into a Solar Shielded corral and destroying the corral around it, also for Largos, placing it into a dark area then dragging it out by the vacpack. For pures, this can be fixed by removing from the world by vaccing them up. For largos, this is permanent. Most likely a bug but something I found interesting while observing their behaviour. Also, I was recently made aware that Saber Hunters do not go invisible when pouncing. Here's the pure Hunter next to it doing it correctly. The glass structures dotted around the glass desert may be a reference to fulgurite; glass tubes formed when lightning strikes soil, sand or rock. Fulgurite is sometimes referred to as "petrified lightning", which some of the structures resemble. The Thundering Glass Sculpture decoration in particular heavily references this. The Ruins were not Slime-made, they were apparently made from a 'civilization that loved Slimes so much they built this place for them' which may be a reference to ancient civilizations worshipping a species/object and dedicating areas/temples to it/them. Gold Slimes treat unripe food as normal, and will still produce plorts when colliding with them. These facts are really fun! The texture inside of a crystal in the upgraded Grotto brings to mind Disney's rendition of the Jungle Book; specifically when Kaa is hypnotising Mowgli. All the rings around the Slime Rancher world are a reference to the "Three Ring" when co-founders of Monomi Park, Nick and Mike, and Monomi Park devs Ian and Chris have previously worked. A lucky slime will spawn on the first day of a newly created save (at least for me). A slime becomes a largo just before it eats the plort. If you vac a slime just as it's eating the plort, you will get a largo, but also the plort. The reason you can't grow kookadobas and keep quicksilvers is that then you can get kookadobas and quicksilver plorts whenever you like and won't even have to play the minigames, all you have to do is collect things from your ranch. Also, apparently the most uncommonly used largo is Rad Tangle. This is what it looked like under the slime sea back in the old demo. I have no idea if it's changed since then. The sea floor has a different texture now (and it also uses a different texture in the Glass Desert), but other than that, it's the same as it was earlier. EmeraldPlay wrote: The sea floor has a different texture now (and it also uses a different texture in the Glass Desert), but other than that, it's the same as it was earlier. Wait, but why would they need to change the texture, though? Honestly, I'm not sure. It wasn't ever intended for you to be able to see it. In certain areas it's possible to see the floor. Or at least it used to be. Might as well have a texture for it. There is an unused soundtrack called 'Less Awful Ravenous Rainbows'. It is a major version of the better known 'Those Awful Ravenous Rainbows'. The title brings to mind the so-called 'mellow-face'. Noggy05 wrote: There is an unused soundtrack called 'Less Awful Ravenous Rainbows'. It is a major version of the better known 'Those Awful Ravenous Rainbows'. The title brings to mind the so-called 'mellow-face'. "Less Awful Ravenous Rainbows" is actually used, but not in game. It is only used in the trailer.